We are having the most unusual weather in Seattle. Just last week it was snowing and today we had weather in the 60 degree range. Blue skies, sunshine, and above 60 degrees makes it “shorts” and “tank-top” weather around here. You have to live in Seattle to appreciate days like this – we’ve had a very gray, cold, wet winter. People around here celebrate the sunshine with BBQ’s, cold beer, iced tea, and yard work. Because of the awesome weather today I decided to make a salad for dinner. It is inspired by some take out my sister brought me from Seattle Deli, a very popular Vietnamese deli in South Seattle. The BBQ Pork I grilled was spectacular exceeding my exceptions. I couldn’t stop eating it! This is the perfect salad to serve for lunch or dinner on a warm spring/summer night. So refreshing and so filling! If you find yourself enjoying some warm sunshine, consider this salad. You won’t regret it. 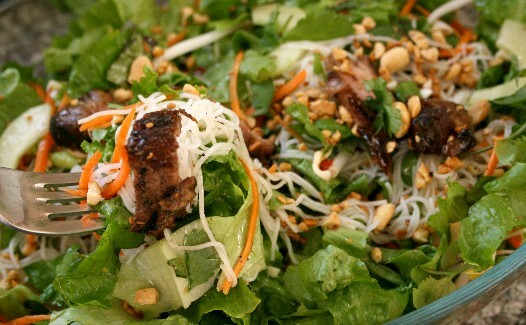 A delicious refreshing main course salad. 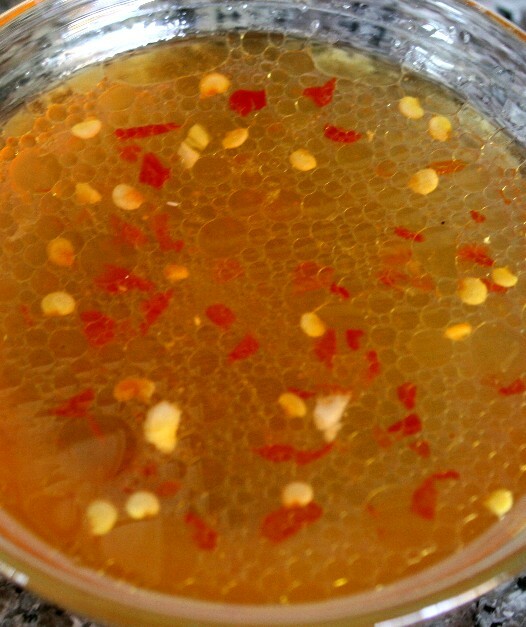 To make the marinade add the lime juice, water, fish sauce, olive oil, soy sauce, and sugar to a small sauce pan. Whisk the ingredients then cook the sauce (to a boil) then remove from heat. Transfer the sauce to a medium bowl and allow it to cool to room temperature. When the sauce is ready, add the onions and pork. 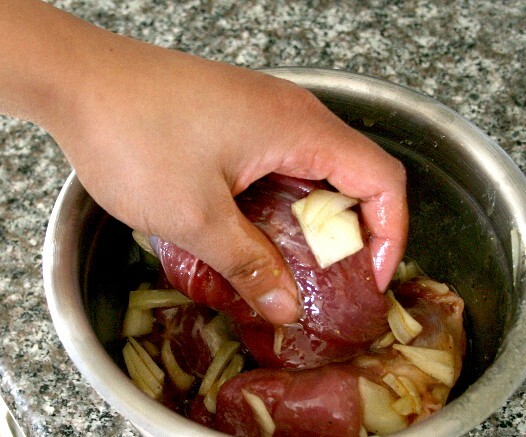 Massage the meat with your hands for a few minutes. Allow the meat to marinate for at least 1 hour, but overnight is best. To make the salad dressing, whisk all the dressing ingredients and store in a sealed container in the refrigerator until ready to use. Ideally, the dressing should be made several hours ahead of time in order to give the sugar time to dissolve. If you need the dressing sooner, feel free to cook the dressing on the stove and whisk the liquids until the sugar has dissolved. Allow the dressing to cool down before using. 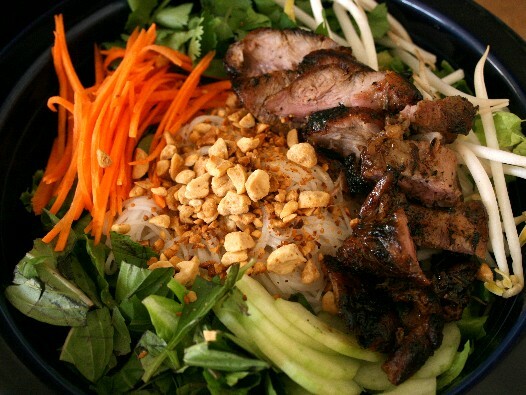 When you’re ready to make the salad bowl, cook the vermicelli noodles according to package instructions, making sure to drain and rinse the noodles in cold water. Set aside. *You may want to use kitchen shears to cut the noodles a few times. This makes it easier to handle and distribute the noodles between plates. Pre-heat a grill pan or grill on medium high heat. Lightly season the pork with salt and pepper just before cooking. 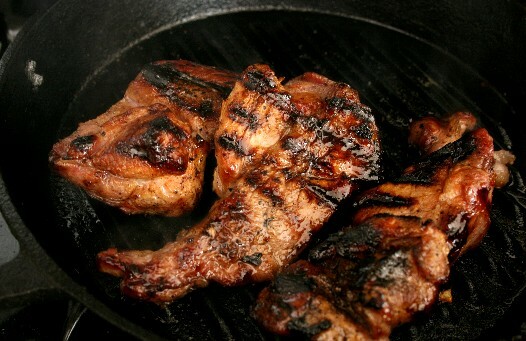 Cook the pork until the internal temperature is 140F degrees. Remove the meat from heat and allow it to rest for 5 minutes. Cut the pork in thin slices against the grain or into bite sized pieces. Side note: I typically grill meat indoors using my cast iron grill. To assemble the salad, layer the lettuce on the bottom of each plate (4-6 servings). Add the noodles in the center of each bowl on top of the lettuce. 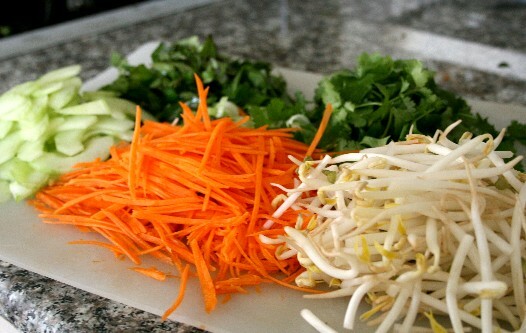 Take the individual elements like the pork, carrots, cucumber, bean sprouts, basil, cilantro, and green onions and place them around the noodles on the outer edge of the plate/bowl. 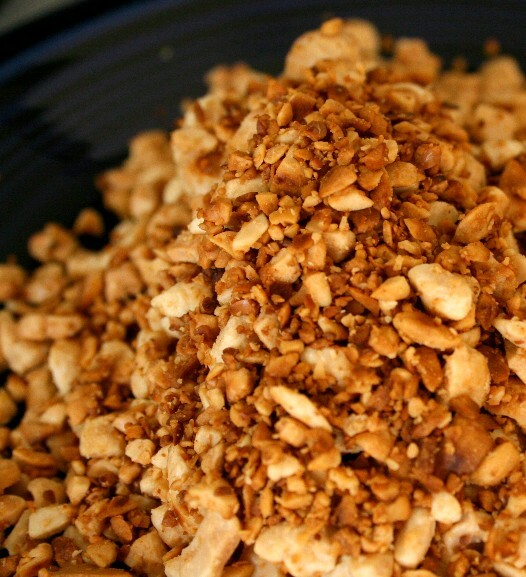 Lastly, top each salad off with the toasted peanuts. Serve each salad with individual bowls of salad dressing for dipping or tossing into the salad directly. Enjoy! This was delicious! I would add a lime to garnish. Thanks for the recipe!! I used country style ribs and they cooked too fast on med/high heat. They turned out too tough. I think next time I will boil them or steam them for an hour like I usually do and them put them on the grill the last 10 minutes. This is the second time I have made this. I tweaked the dressing by decreasing the sugar to 1/2 cup, increasing the garlic to three cloves and adding 1 1/2 Tbs. of Orange Juice. This “secret ingredient” was given to me by a sweet lady from Vietnam who use to have a restaurant. My Husband and I thought it was so much better. We will definately be making it often.